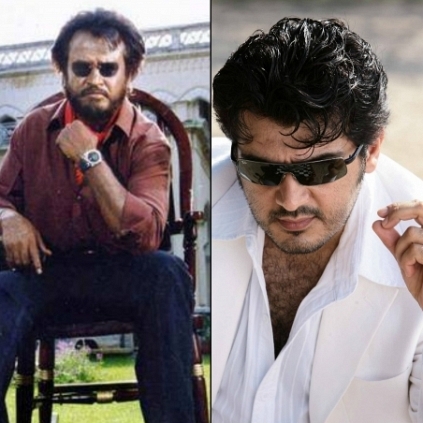 Thala 56' to have a mass scene like Rajinikanth's Baasha ?? BAASHA KIND OF SCENE IN THALA 56 ?? Shooting spot stills of Ajith Kumar’s upcoming film ‘Thala 56’ directed by Siruthai Siva, were leaked recently and have been circulated widely in all the social platforms for the past couple of days. People have been sharing their own interpretations on Ajith’s looks in the film. The stills show Ajith in a baggy green khadi shirt with thiruneer (sacred ash) on his forehead alongside Lakshmi Menon, who happens to play Ajith’s younger sister in the film. It looks like a college set up with Lakshmi Menon holding a drafter holder, while Thala is seen carrying a book in hand. With the look of things, Lakshmi Menon might be doing her engineering, possibly civil stream and Ajith might either be dropping his sister at college or he might even be a lecturer at the very same campus since Ajith dons a traditional attire, something similar to what Rajini wore in Dharmathin Thalaivan (A Tamil professor with tripundra or thiruneer on his forehead and sporting a white dhoti). On the other side, our imagination also takes us to a massy scene from Rajinikanth’s Baasha, where Rajini reveals his true identity as a don to a college chairman, who misbehaves with his sister. Till date, this stands as one of the highlight mass scenes, to ever be made in Tamil cinema. Will this scene from 'Thala 56' be on the lines of the cult scene from Baasha? Superstar Rajini - Ranjith's next - Singam 'Singlea' Dan Vara Pogudha ? Masss is even bigger in Telugu ! What is Vaalu's run time? Jigarthanda goes for a huge price ? What's it with Nayanthara - Vignesh Shivan's marriage talks? After Superstar and Dhanush, it's Sivakarthikeyan now ! Vikram Prabhu's Next Film Is Named After Rajinikanth's Old Film Thani Kaattu Raja? A Trend Analysis Of Rajinikanth And Kamal Haasan's Film Over The Last Ten Years. Superstar Rajinikanth And Shankar Are Set To Join Hands Yet Again. People looking for online information on Ajith Kumar, Baasha, Rajinikanth, Superstar, Thala, Thala 56 will find this news story useful.